Famed for its popular River Walk and eye-catching Tower of Americas, San Antonio has long been a busy tourist destination and contains a healthy selection of hotels, both in the city and close to San Antonio International Airport (SAT). Accommodation in this area often becomes fully booked during major sporting events, local festivals and major conventions, so advance reservations are often a necessity, particularly when staying in the most desirable spots. A number of popular and reliable hotels lie close to San Antonio International Airport (SAT), with brands such as Best Western, Comfort Suites, Courtyard, Doubletree, Embassy Suites and Holiday Inn all within 1 mile / 2 km of the terminals. Most notable hotels close to the airport provide complimentary shuttle buses which can be requested upon arrival. Many of the most popular hotels lie in the heart of San Antonio, which is just 8 miles / 13 km south from SAT International Airport, connected by a range of ground transportation. Those looking for budget accommodation should consider staying on the outskirts of the city, where cheap hotels, motels and hostels can be found. The HI San Antonio Hostel is especially popular and lies just 3 km / 2 miles from the city center, along Pierce Street, and is easy to reach, offering the city's cheapest lodging. Central to city life, downtown San Antonio is where most visitors to the city choose to stay and hotels are plentiful here, with all requirements catered for. Accommodation in the downtown district has the advantage of being within walking distance of many top attractions, such as a number of prominent museums, the Rivercenter Mall and the scenic Riverwalk. Many hotels can be found close to the River Walk and are often reasonably priced, including the Arbor House Inn along St. Marys Street and both the Days Inn and Red Roof Inn off East Houston Street. A wealthy neighborhood full of character, many of San Antonio's best hotels and restaurants can be found in this district, particularly around Broadway, Lincoln Heights, New Braunfels and close to the impressive Brackenridge Park golf course. Other highlights in this part of the city include the acclaimed Botanical Gardens and many excellent clusters of shops. Home to a number of small hotels, guest houses and B&Bs, San Antonio's King William district is steeped in history and is largely residential. However, a good selection of art galleries, eateries and bars can be found here. 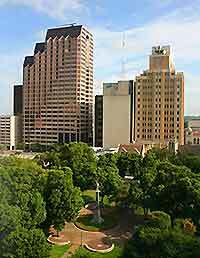 An important commercial area of the city, the Northwest district contains many impressive high-rise buildings, including the highly regarded South Texas Medical Center. Hotels in this part of San Antonio are well-placed for those looking to visit the area's popular Sea World and Flags Fiesta Texas theme parks. Accommodation in the Monte Vista area is centered around the Trinity University and with such a large student population, this district is a vibrant and lively area of San Antonio. Monte Vista is home to a number of attractions, many of which can be found along Main Avenue, including several noteworthy restaurants.